Justin's WeatherTalk: Report Card: A Whole Lot of Nothing? 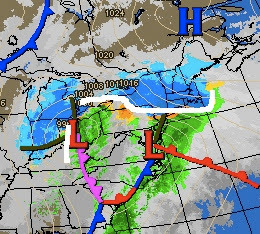 Here is the verified surface weather map for Sunday morning. The same time frame I was using with the GFS model all week. Overall, I think it did a good job with positioning. The major problem was the delay in the initial precipitation. Since it began for most of us between 7pm-9pm, the atmosphere had a chance to warm up a little and not produce the snow or sleet expected. That would have helped to hold the temps down longer, and result in more ice. I did notice many spots did have some icing north and west of the beltway. Even ABC2 was down below freezing until midnight, so some ice did build up, but not much. Here was what I woke up to: I live north in 'hill country' and did not break to 33F until 4am. This begs the question: Does it count if you slept through it? I've often wondered that. That goes along the same lines as you hearing a forecast for snow, but it's not in front of you house. So if it happened, but not for your area, is that a busted forecast? 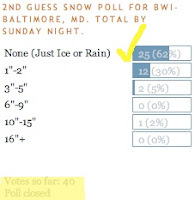 This brings up another poll questions I have posted at the right. The final part of this storm will be the wind. We do have Wind Advisory for this afternoon and tonight. While we may see a snow shower- especially north and west... we should all have winds gusting between 40 and 50 mph.